A restaurant that actually cares for your waistline? It may sound like a fantasy, but Rouge Tomate does just that. I met with nutritionist Natalia Rusin last Spring to share lunch and chat about our ongoing projects. While she explained the concept behind the restaurant and how the light yet luscious food is created, I was excited to see food that maintained the elegance of finely crafted food that you will find in some of the top restaurants in New York City. “I was watching Julia Child before Sesame Street,” Natalia said as the waiter set down a freshly juiced cocktail that tasted more like a bright fresh mojito. It contained more than five nutritious herbs and vegetables, like basil, fennel, spinach, and lettuce, but didn’t taste at all like the sour green juice I have had in health food stores. The waiter arrived next with a plate of the freshest asparagus I have even seen pressed into a vegetable coulis, topped with a warm organic poached egg. Its creamy yellow poured out as I pressed it with my fork. sustainable local ingredients, creating ideal perfectly portioned meals that won’t leave you feeling hungry but still maintain calories around 500 or less. enhancement: optimizing nutritional value through the synergy of product combination and menu diversity. 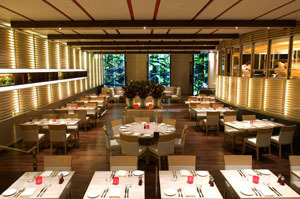 The decor is hip and young, that could also serve as an ideal place to have a business lunch or dinner. The menu includes seasonal delights like local fluke ceviche and buttery lobster, that you can enjoy for around dining room and Ã¢Ë†Å¡Ã¢â‚¬Â la carte and prix fixe pricing, $35 at lunch, $75 at dinner. Want to chop like a professional chef? Find out how in my blog entry about how to use a knife at AOL Food, and check out my exclusive Slashfood blogs every Monday and Friday on AOL. When it comes to cooking, salt is the most important ingredient. Find out how to use salt. I live on Vancouver Island and there is a very active farming and restaurant community here that work strongly together to promote keeping things local. A lot of the restaurants source as much of their food as possible from local farmers. It’s great to see other restaurants in larger cities also following this concept. Sounds like a wonderful place, hope I get to visit some day 🙂 Keep up the great work!